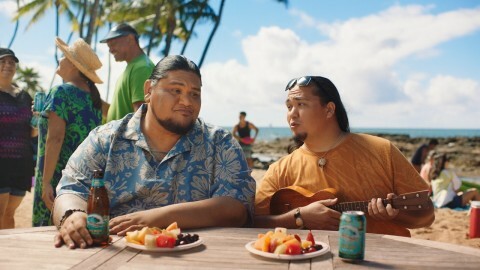 KAILUA-KONA, Hawaii--(BUSINESS WIRE)--Whether it’s enjoying a little vacation in every sip, rethinking your ‘to-do’ list, or disconnecting for a few moments, Kona Brewing Company’s beloved “Bruddahs” will show you the way in three new national TV ads launching during March Madness 2019. For Kona Brewing Co.’s first-ever national TV campaign, the “Bruddahs” – Hawaii’s own David Bell and Blake “Brutus” LaBenz – return to the screen and poke a little fun at today’s always-connected consumer with some island- and Kona-inspired solutions to bring a little more aloha into our everyday lives. The three new :30 second ads will air throughout the NCAA’s March Madness tournament on National TV and on Local TV in select markets, with the first national spot running March 21st. In addition to celebrating March Madness with consumers and fans, Kona Brewing Co. is ensuring its employees across the country enjoy this seminal sports event by hosting “March Gladness” office viewing parties and sharing an invitation to enjoy a “little vacation.” Inspired by the new ad, where every sip of Kona tastes like a little vacation, Kona Brewing Co. is offering to reimburse all its employees up to $20 each to spend on their favorite Kona beer, in bars or retail stores. The internal “little vacation” offer begins March 21st, when the first national TV ad runs. Celebrating its 25th year, Kona Brewing Company was born in Kailua-Kona on the Big Island of Hawaii in the spring of 1994 by father and son team Cameron Healy and Spoon Khalsa, who had a dream to create fresh, local island brews made with spirit, passion and quality. Today, Kona is Hawaii’s longest-running and favorite craft brewery, known for top-selling flagship beers Big Wave Golden Ale and Longboard Island Lager and innovative small-batch beers brewed exclusively on and for the Islands. From the beginning, Kona has remained committed to brewing the freshest beer of exceptional quality closest to market, which helps to minimize its carbon footprint by reducing shipping of raw materials, finished beer and packaging materials. In 2019, Kona Brewing Co. will open a brand new 100,000-square foot brewery steps away from its original brewery and pub. Built with the latest innovations in technology and resource efficiency, the new brewery will be one of the most environmentally sustainable brewers in the world.